Click here to download the Letter Guidance Template. Click here to download the Postcard Guidance Template. Use the find nearest feature? Review letters prior to sending? 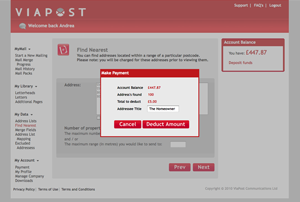 ViaPost version 2.0 has been built with simplicity in mind. It will allow you to create and send letters online to any UK address, be it one or tens of thousands, with minimum fuss and maximum efficiency. 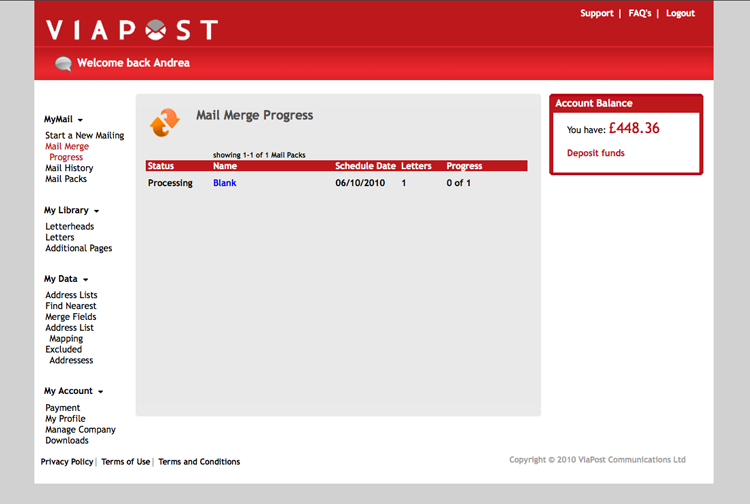 You can include merged fields in your letters; this allows you to personalise them with customisable information, and you have an electronic proof of posting for every job sent through ViaPost, and every letter within that job. Please take the time to carefully read this user guide to ensure that you are able to access the full benefits of the system. 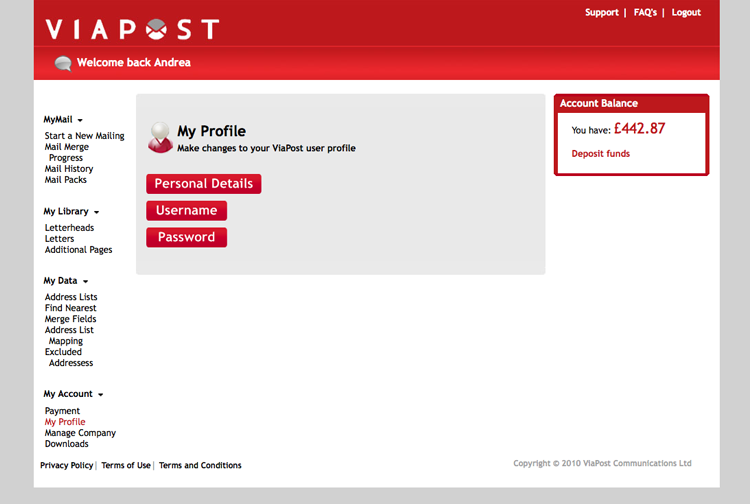 If you havent already done so, please create an account for yourself at www.viapost.com. 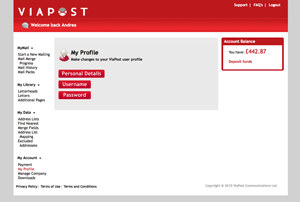 Log into the system and you will be brought to the home page and prompted to either send a simple letter or send a mailpack mailing. 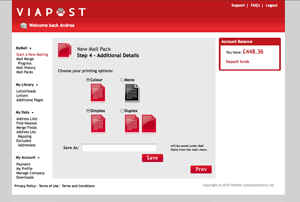 A simple Mailing is a letter in PDF or Word XML format that will be sent without a letterhead or any extra pages. 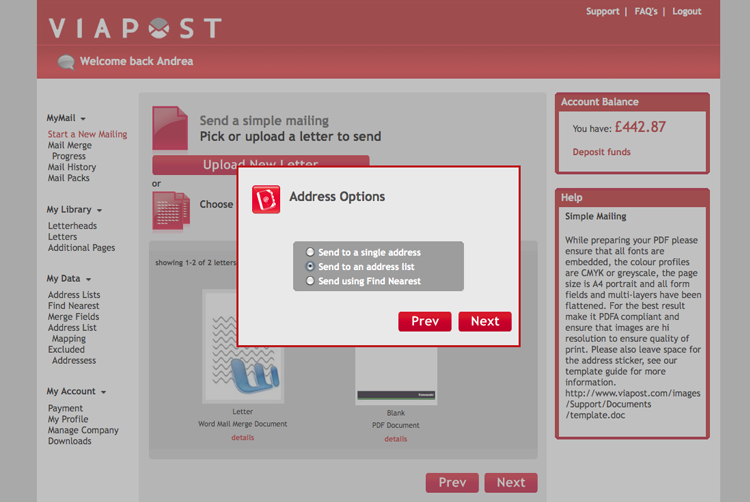 To send a simple letter select the send a simple mailing option and click next. 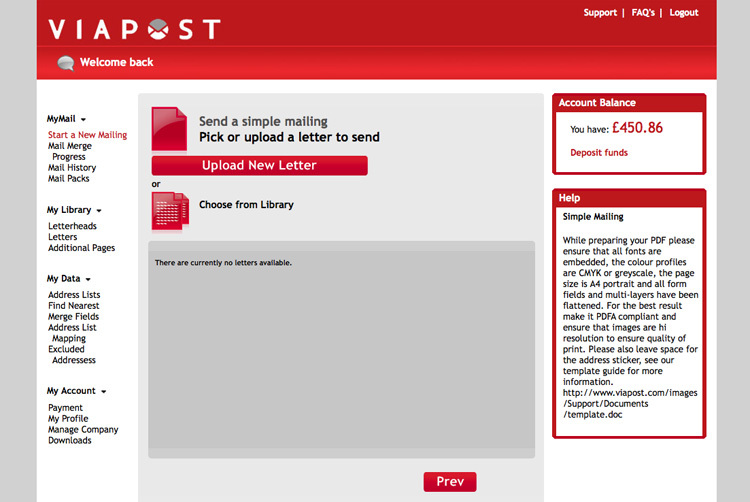 You will then be able to either upload a new letter or choose from existing letters that you have uploaded previously, then click next (please refer to the Uploading documents section for more details on how to upload). The system operates quicker if you use PDF documents; however, if you use a Word XML, document mail merge fields are supported. 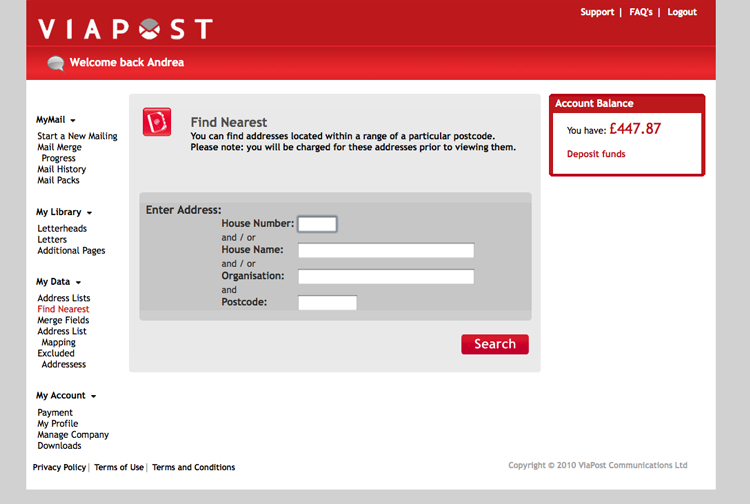 You will then be directed to choose to send to a single address, an address list or send using find nearest. 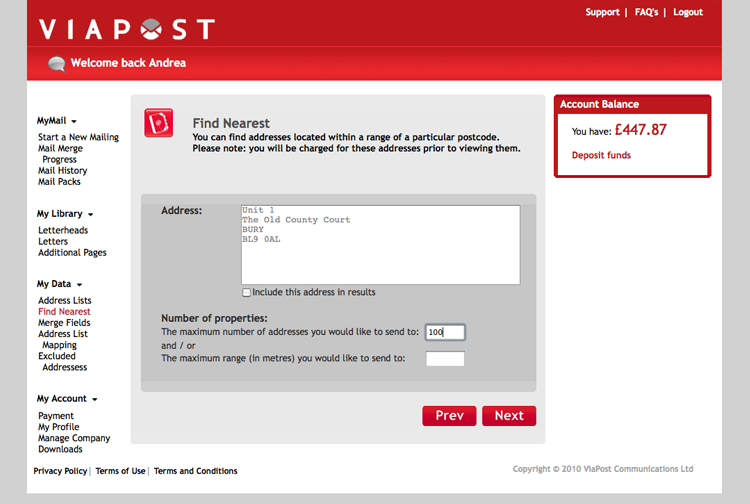 If you want to send the letter to a single address then select the Single Address option and click next. You can then enter the address and check it against the database (please refer to the address validation section for further details on this). Once your address has been validated you will be taken to review the letter before sending (please refer to the review letter section for further details). 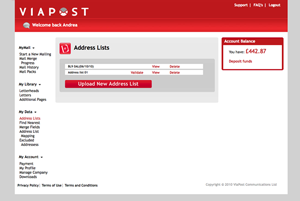 If you want to send the letter to multiple addresses then you can either upload a new address list or use a previously uploaded list (please refer to the address list section for details on how to upload address lists). Once you have chosen the address list that you want to use you will be taken to review the letter before it is sent. (please refer to the review letter section for further details). If you want to send your letter using find nearest then please click here for more information on how to do this. 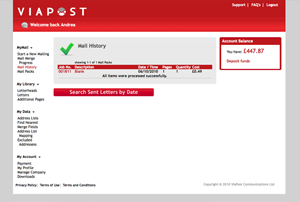 Once you have reviewed your letter, click send and the job is submitted to our daily batch and will be delivered by Royal Mail three days later. 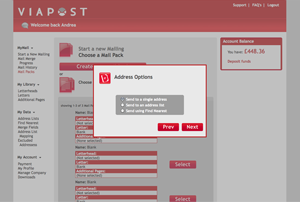 A mailpack is a letter that you can create within the portal, merging a letter in word format onto a letterhead in PDF format with the option to add additional PDF pages (maps, adverts, flyers, campaigns etc.) to either be put onto the back of the letter or inserted as additional pages. 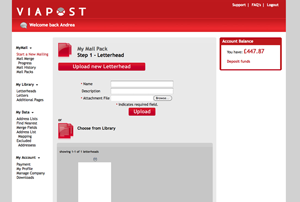 To create a mailpack select the send a mailpack mailing option and click next. 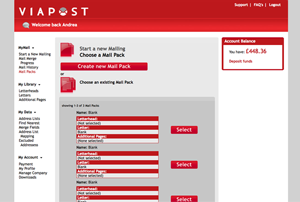 Click on the create new mailpack button; you will then be asked to select the letterhead that you wish to use for this mailpack. You can either upload a new letterhead (please refer to the Uploading Documents section for more details) or use one that you have previously uploaded. If you are planning to upload a word document with more than one page and only want the letterhead to be applied to the first page, then check the apply to first box only page. If you want each page to be on letterheaded paper, then leave this box unchecked. If you do not want any letterhead on your mailpack, select the blank page option. Once you have chosen your letterhead, you will be directed to choose the letter that will appear on the letterhead. 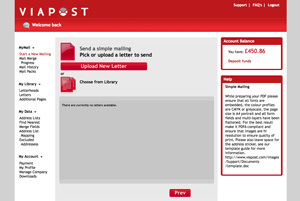 Again you can either upload a new letter or choose an existing letter that you have previously uploaded (please refer to the Uploading Documents section for more details). 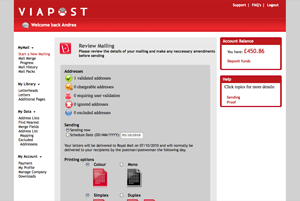 If you want to review the letter before selecting it for the mailpack, then click on the details link below the letter and then the view file link. The letter will then open in word for review. Select the letter that you wish to use and click next. You may now add any additional pages to your mailpack. You can either upload a new additional page (please refer to the Uploading Documents section for more details) or use one that has already been uploaded. 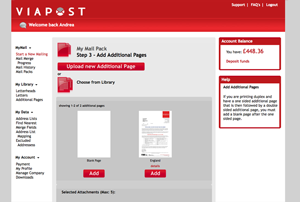 Select the additional page(s) that you wish to include and they will appear in the selected attachments box in the order that they will appear in the mailpack. You can delete any additional pages by clicking the remove button next to the page. If you are printing duplex then each additional page that is uploaded will print sequentially. So if you upload two one sided additional pages, they will print on one piece of A4 paper on the front and back of the sheet. For any additional page with an odd number of sides that is followed by another page, you must remember to insert a blank additional page immediately afterwards if you want the next additional page to print on a separate piece of paper. 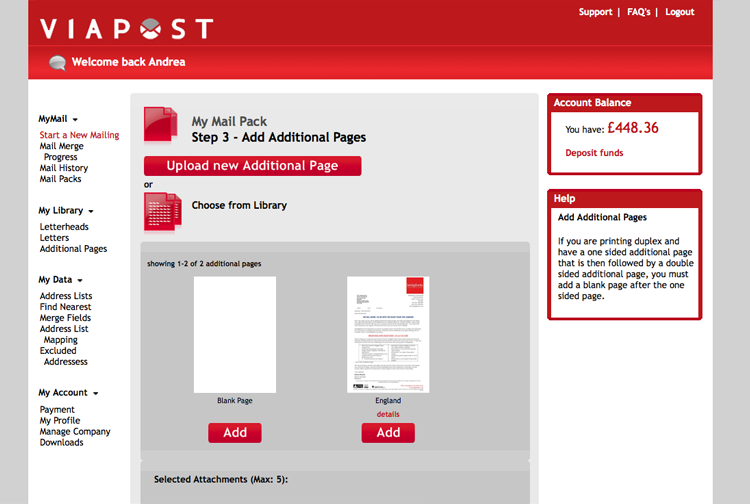 Once you have your additional pages in the order you require, or if you do not want any additional pages in your mailpack, then click the next button at the bottom of the screen. Finally please select whether you would like to have the mailpack printed in mono (black and white) or colour, and whether it will be simplex print (just on the front of the paper) or duplex (on the front and back of each piece of paper). You then name your mailpack and save it. This mailpack is now saved on your account. 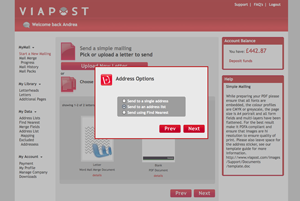 To send a mailpack letter you begin from start a new mailing on the right hand menu. 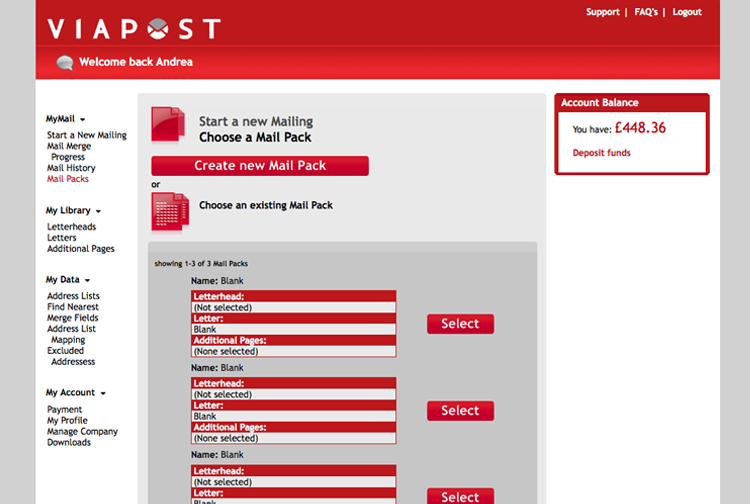 Select send a mailpack mailing and you will be able to choose to send a saved mailpack. 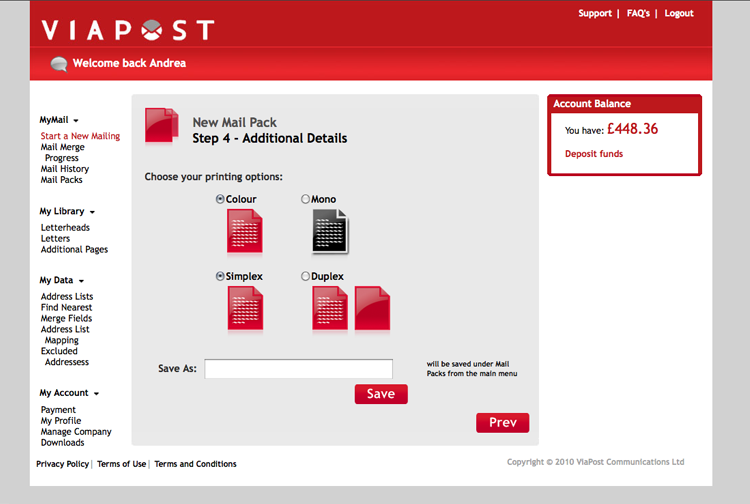 Cli cking the mail packs option on the menu will take you straight to this point. 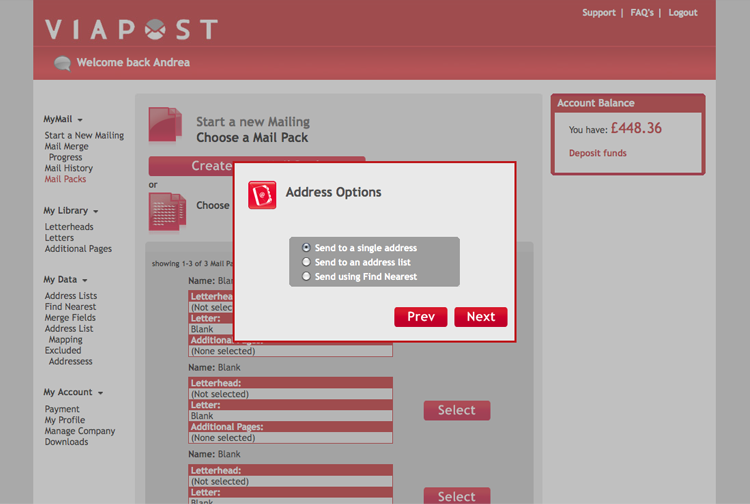 Select the mailpack that you wish to send and you will be directed to choose an address list or send to a single address. 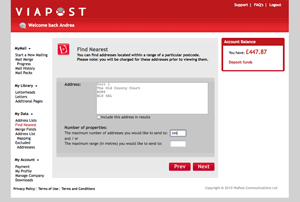 If you want to send the letter to a single address then select the Single Address option and click next. You can then enter the address and check it against the database (please refer to the address validation section for further details on this). Once your address has been validated you will be taken to review the letter before sending (please refer to the review letter section for further details). 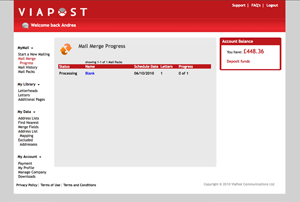 If you are sending a letter to a single address then the job will process immediately, but if you are sending to a large number of addresses you can check the progress of the job as it submits to our system. Click on the mail merge progress option on the right hand menu, this will then show a list of all current jobs that are being processed through our system along with an update as to the progress of that job. You can click onto the name of the job to see a list of each letter that has been processed up to that point. Clicking on the individual letter will open that letter in PDF form. While a letter has a blue dot next to it you are still able to click on the delete button to remove it from the batch. 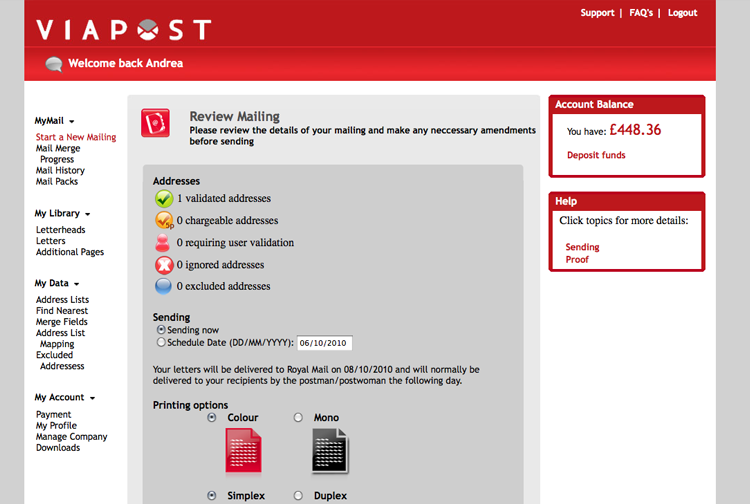 You will be refunded and the letter will not be sent. 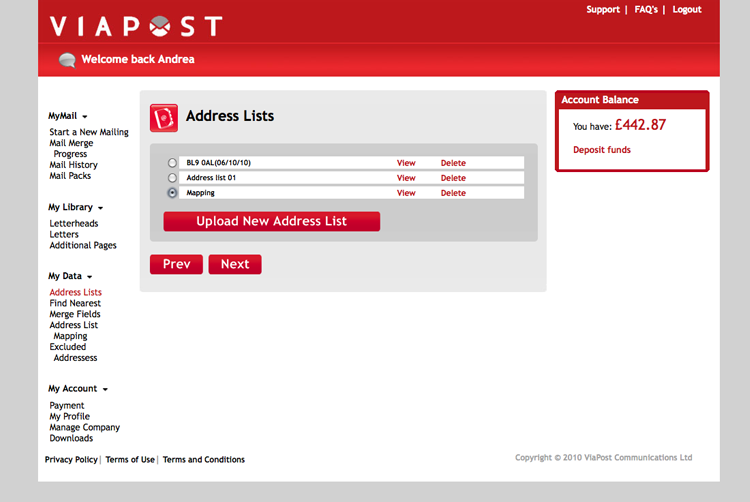 To review all the jobs that you have sent ViaPost, click on mail history on the right hand menu. This will give you a list of all fully completed jobs that you have sent. You can click onto the name of the job to see a list of each letter that has been sent. Clicking on the individual letter will open that letter in PDF form. While a letter has a blue dot next to it you are still able to click on the delete button to remove it from the batch. 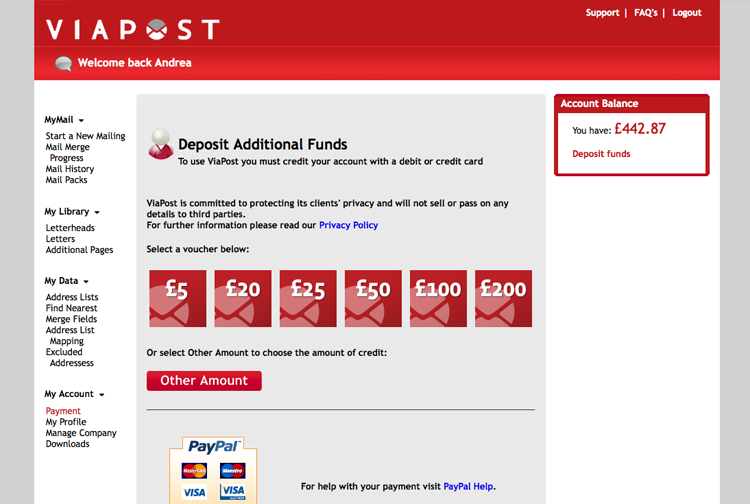 You will be refunded the amount that it cost to send the letter and the letter will not be sent. 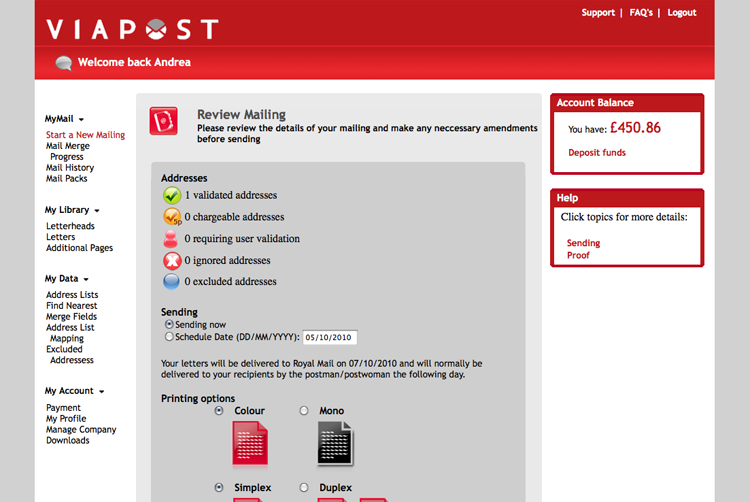 If the letter has a red dot next to it then it has already been sent and you will not be able to delete it from the batch. Upload a document (PDF or Word XML)? 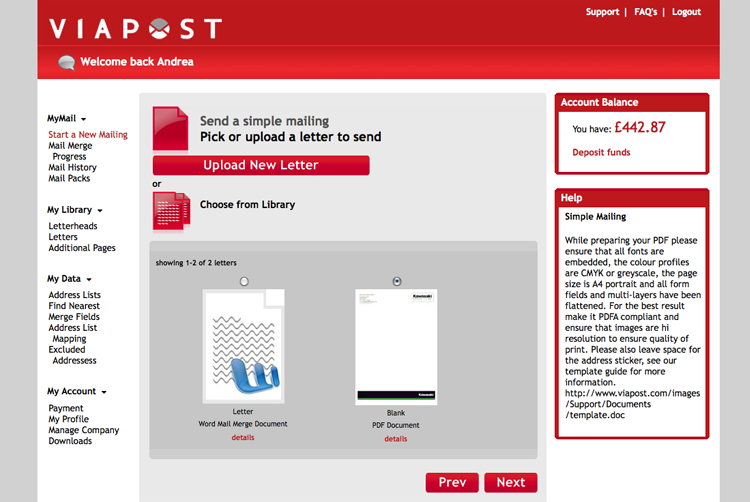 Whether you are uploading a PDF letter, letterhead or additional page the process for uploading a PDF remains that same. 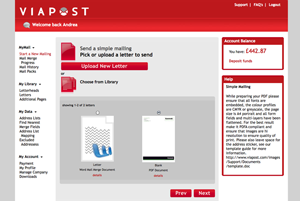 You can either upload your PDFs as part of the wizard process for sending a simple letter or creating a mailpack, or for mailpack items by clicking on the relevant link (letterhead, letter or additional pages) on the right hand menu. Click on the upload button and you will be prompted to name your PDF, you may also add a description but this is optional. You can then click on the browse button to search your computer for the PDF. Select the PDF that you wish to upload and then click open then upload. The PDF will now show in the relevant section for review. When you upload a letter as a word xml document you are able to use mail merge fields. It is important that you make sure that this letter is in word xml format for mail merge to work. While preparing your PDF please ensure that all fonts are embedded, the colour profiles are CMYK or greyscale, the page size is A4 portrait and all form fields and multi-layers have been flattened. For the best result make it PDFA compliant and ensure that images are hi resolution to ensure quality of print. Please also leave space for the address sticker, download our template guide at the top of this document for more information. 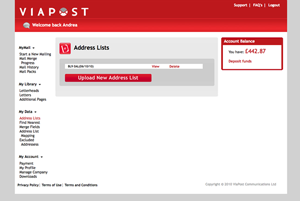 You can either upload your address list as part of the wizard process for sending a simple letter or creating a mailpack, or by clicking on the address lists link on the right hand menu. Click on upload new address list and then select browse to locate the list on your computer. All address lists must be in csv format (you can create a csv using excel). Give the address list a name and click next. You will then be asked to select mapping for the address list (see the mapping section below for more information on this process). Once you have done so click next and you will see a progress bar that shows how much of the list has been imported. 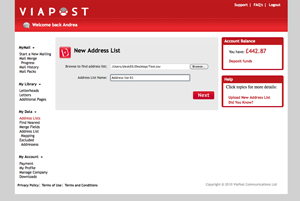 We check all addresses against the Royal Mail database so for big lists this may take a long time to import, however you can navigate away from this page and the list will continue to import in the background. Clicking on the address lists link on the right hand menu will show you the progress of the import process. Validate These are addresses that require you to validate them further, the Viapost system may have some suggestions for you. 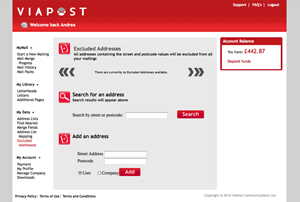 Chargeable - These addresses do not match the Royal Mail database and will have to be forced through our system. There will be a charge for using this address. Ignored- This addresses are those that you have chosen to ignore during the validation process. Once your address list has been imported you will see how many of the addresses fall into each category. 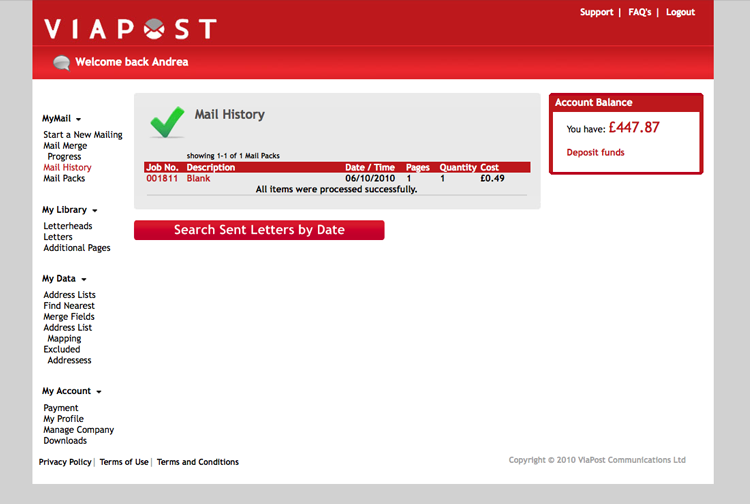 Click on the red validate button next to the address list. You will now be shown each address that is not fully validated. 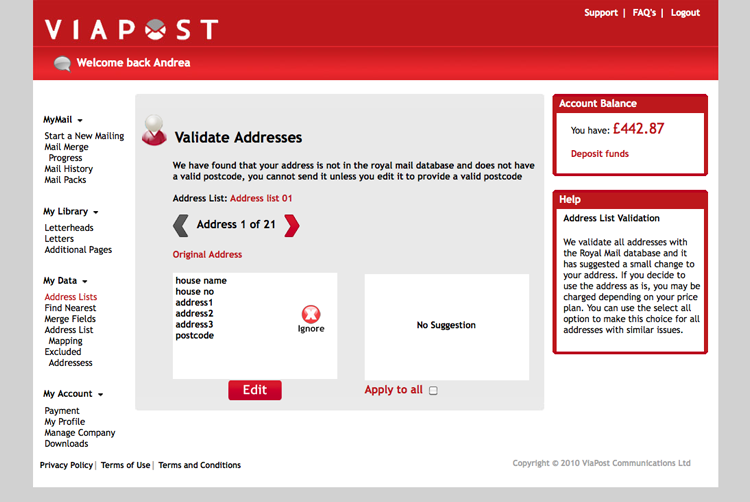 With a lot of addresses we can make a small correction to make it fit the Royal Mail database. If this is possible then a suggestion will come up in the suggested address box. To accept the changes click the green approved tick in the suggested address box. 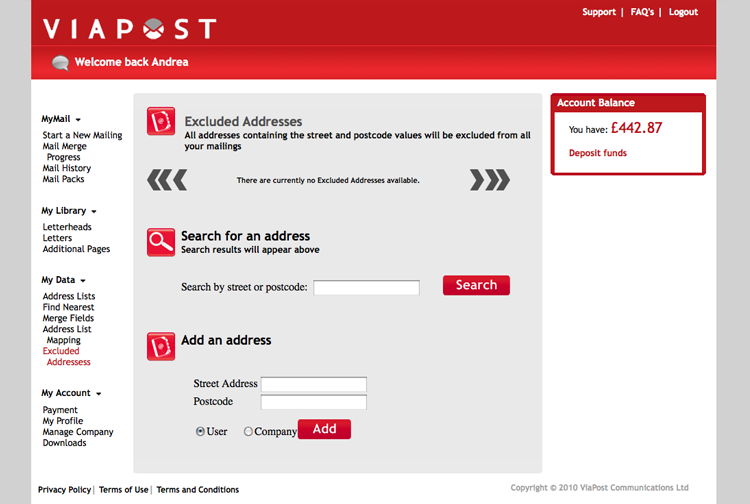 To accept this change to all addresses it could apply to, check the apply to all box. If you chose not to accept the suggestion you can either ignore the address or accept that it will become chargable. If we cannot find a suggested change then there will be no suggestion in the suggestion box. If we still can send the letter and you wish to force it through then click on the yellow chargeable box. The figure on this box is the amount that you will be charged to force through this address. If we cannot send a letter to an address then there will just be a red ignore box that you will have to select. The letter will not be sent unless the address is modified. At any time you can edit any of the addresses in this section by clicking the edit button. Once you have validated or ignored all of the addresses your address list will be ready for sending. Address mapping allows you to define which columns in the excel spreadsheet that you upload are used for what. When you upload a new address list you will be asked which mapping you would like to use. If you choose no mapping the first seven columns in the spreadsheet will be used as the address. You can choose a previous type of mapping if the address list that you have uploaded is in the same format as previous ones and you have already created a mapping for them. It will then apply the same rules to the new address list. 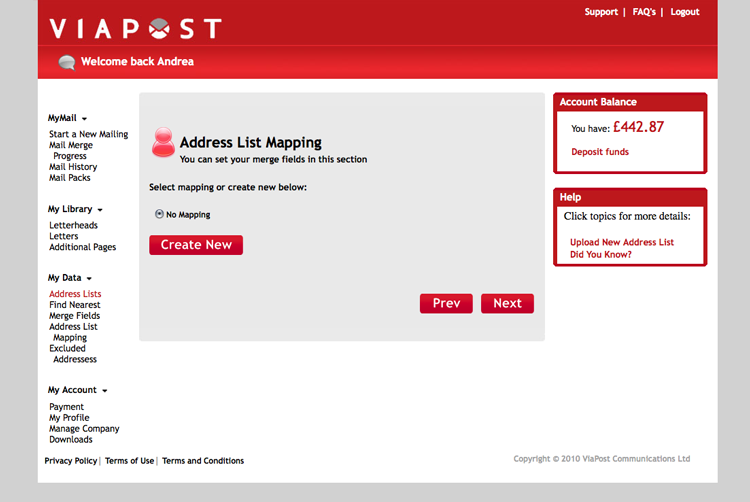 To create a new mapping for the address list click on create new. You will now see each column in the excel sheet listed under column name, with the data from the first line in the data column and then check boxes under address and variable. You can move through the data by clicking the arrows on either side of the heading. If your excel address list doesnt have a header row then uncheck the does the address list contain a header row box. A header row is a list of column names along row a of your excel file. You can now define what these columns are used for. 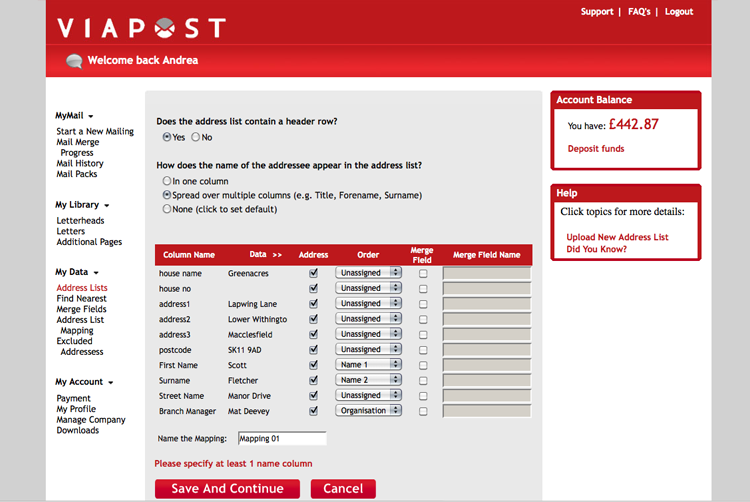 Select the columns that will make up the address by checking the box next to them under address. You can then order them using the drop down boxes under the heading order. There are a maximum of seven lines on the address. You can also now select and name your merged fields (if you have any) by checking the box next to them under variable and naming them in the box under variable name. Dont forget that you can use a column for both part of the address and a merged field. You can then name the mapping and select save and continue. This mapping can now be used for any excel address files that are in the same format. A merged field is a part of your letter that can be personalised. It can be used only with word XML format letters and not with PDF letters. There are no limits to the amount of merged fields that you can use. The first is to use columns on the excel address list that you upload. 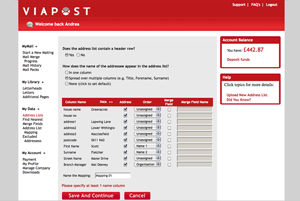 You can either use part of the address columns (for example, if you wanted to personalise the letter to include information already present in the address then you could use that particular column in the address fields) or you can add more columns (another column after the address with the variable information for each entry). You can then use the mapping functionality to define which columns within the PDF are part of the address and which are to be used as merged fields, and to name the merged fields (please refer to the mapping section above for details of how to do this). These are variable merge fields and will be different for every letter based the information defined by the entries within the excel sheet. The other way to use merged fields is to use the merged fields link on the right hand menu. Here you can create a merged field by clicking on add new variable and then adding the field name (this is what you will call the field) and the field value (this is what will actually appear on the letter. These merge fields are the same on every mail merge letter that you include them in. At the point(s) in the letter that you want to place a merged field you insert a code which allows our system to look for the personalised information that you want merged into the letter. The code to use is <VP_name/> The name part of the code is changed the match the name that you assign to the field. So if, for example, you name the merged field amount then you will write the code <VP_amount/> on the letter. You can view, edit and delete your saved mappings by clicking on the address list mapping link on the right hand menu. The Find Nearest Feature allows you to generate a list of addresses around a user defined address. The amount of addresses can be chosen either by a number (for example the nearest 40 addresses) or by distance (for example every address within a 100 yard radius). 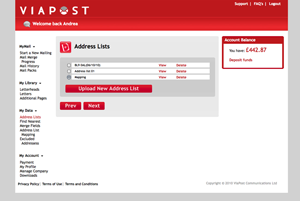 To generate an address list, select the Find Nearest option on the left hand menu and enter the details of the address that you wish to use as the base point. The list will be generated from the nearest address around this initial address. When you have entered the details of your starting address, click on the search button. You will then be shown the full address that you have chosen and asked to define how many address you would like to be in the address list. This can either be defined by a number of addresses or by a range from the primary address in metres. 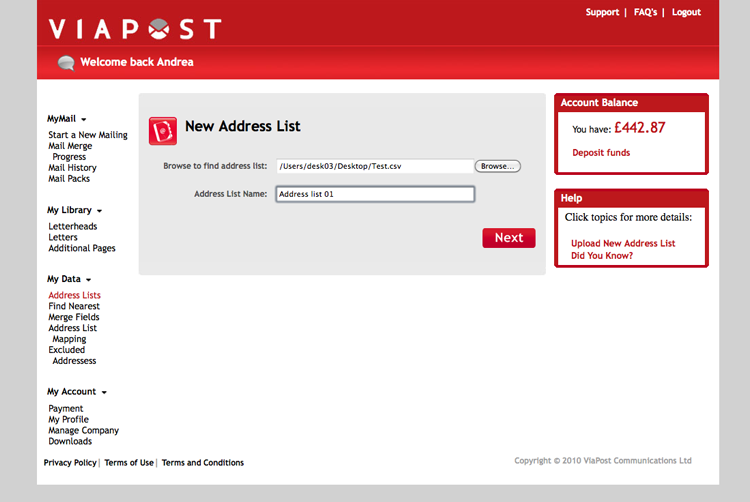 Select the option that you would like to use to generate the address list and click next. You will then be presented with a pop-up screen confirming how many addresses have been found, the cost of purchasing the addresses and the title that you would like to use for the addressee (this defaults to The Homeowner). If you are happy with the above then click on the deduct amount button. The address list will now be generated and you will be taken to the address list section of your account where it will show with all addresses validated. The file will be named by the postcode that you used to perform the search and the date of the search. You can now send letters to this address list as many times as you want. If you have certain address that you do not wish to send any mail to, you can place them on a list of permanently excluded addresses. Once an address is on this list our system will not send any letters to the address, regardless of whether or not it features in a mailing list. To add an address to the excluded list click on the excluded addresses link on the left hand menu and then enter the house number and postcode of the address in the section underneath the heading add an address. 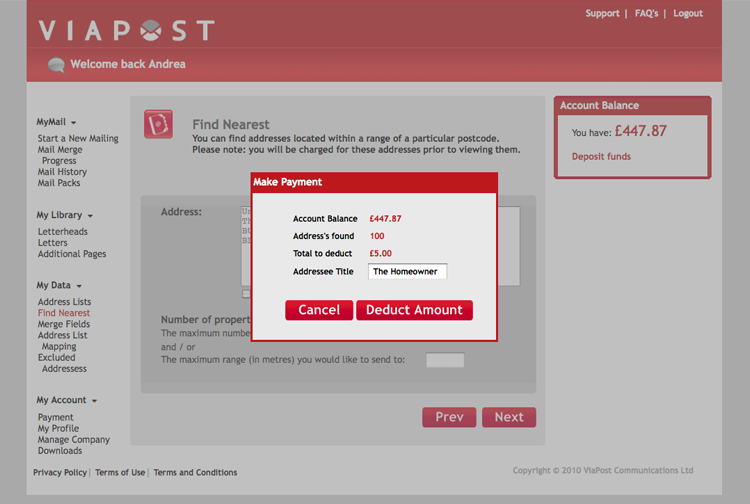 Select the add button and the address will be added to the list of excluded addresses at the top of the screen. 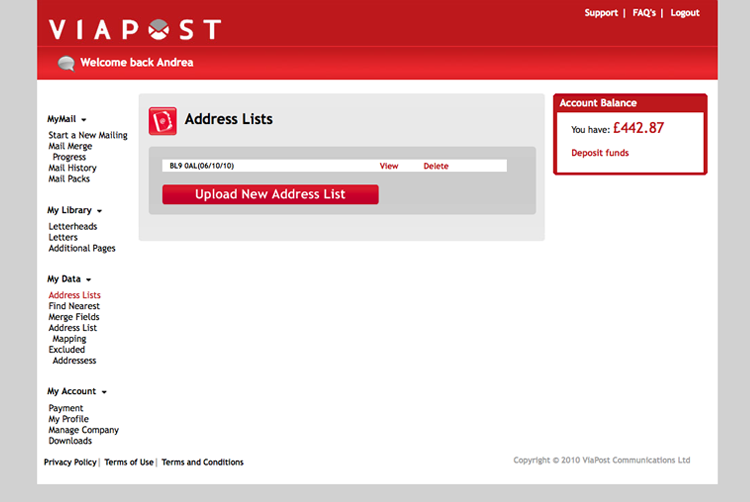 If your company has more than one account with ViaPost, select user if you want to only exclude this address from your account or group if you would like the address excluded from all mailings sent from the company account. You can search through all of the excluded addresses by putting either the street name or postcode into the box underneath search addresses and selecting the search button. The list of addresses will now only show addresses that match the search criteria. Once you have chosen the simple letter or mailpack that you wish to send, and chosen the address list or single address that it will be sent to, you will come to the review mailing page. Here you can review the job before it is submitted to our batch. You can either select the sending now button to send the job immediately or schedule a date for sending by selecting that button and entering a date for the job to be processed. The job will then sit in the mail merge progress area until that time, and can be cancelled at any time before the send date. Make sure that the correct options are selected for mono/colour and simplex/duplex. 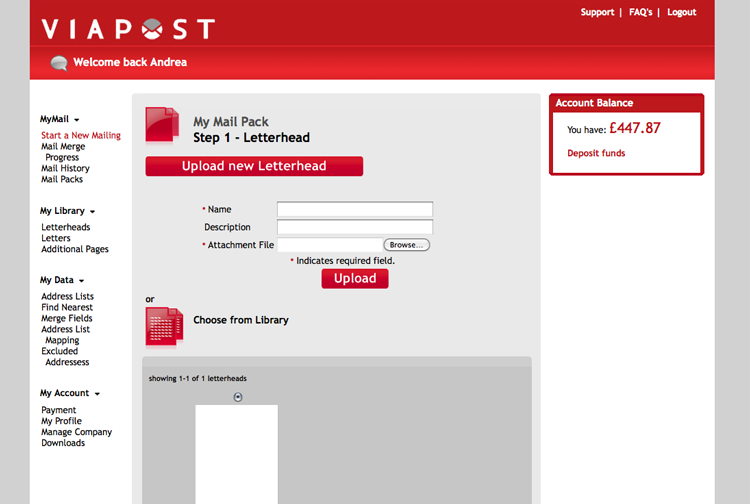 You can then view a proof of the letter(s) that you are about to send. Please be sure to study this before sending as this is exactly how your letters will be sent so be sure that you are happy with the layout before sending. The price of the job will be listed at the bottom of the page, when you are happy with the proof click send and the job is then submitted to our batch and moves to the mail merge progress section. 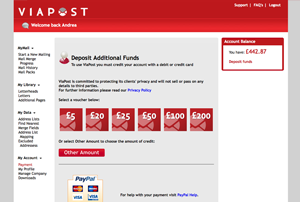 Click on the payment link on the right hand menu and follow the links through to PayPal where you can upload money securely to your account using a credit or debit card. Click on my profile on the right hand menu and you can amend your personal details, username and password.